Scorpions are arachnids with characteristics that distinguish them from other members of their taxonomic class such as spiders and ticks. The body of the scorpions has a chitin (polysaccharide) exoskeleton which is covered by hairs and has two parts or tagmata: the head (cephalothorax or prosoma) and the abdomen (opisthosoma). The chelicera or mouth parts, a couple of pedipalps or claws with pincers at the end, eight legs, the tail (metasoma), a venom deposit (telson) and the stinger (Aculeus), are also pieces that make up their anatomy. Each pincer has a fixed claw and a movable claw. The body of the scorpions has two parts or tagmata: the head and the abdomen. The metasoma or tail has five segments and the telson, which is a vesicle-like organ that stores the poisonous glands. From there, the venom travels when injected into the victim’s body through the stinger. The Scorpions have a very wide range of sizes. While some have a length around 0.47 inches, others have a length up to 7.8 inches as the emperor scorpion (Pandinus imperator). Similarly, their width varies according to the species. Some scorpions are thin and elongated, and others are short and wide. The Asian species Euscorpiops montanus have dimensions that look somewhat disproportionate because the size of their pedipalps is large compared to the length of the tail. Scorpions have several eyes of which two are at the top of the prosoma, and two to five additional pairs are at both front sides. Despite their many eyes, scorpions do not have good visibility, and they are very sensitive to light. Their eyes only work to distinguish between clarity and darkness and perhaps movements, but they are believed to be useless recognizing shapes. In contrast, their sense of smell is very well developed, and they can identify their prey, detect dangers and differentiate males from females. Each one of its eight legs has different segments. From bottom to top, the apotele which has a pair of ungues and the dactyl, the tarsus, the basitarus, the tibia, the patella, the femur, the trochanter and the coxa. The pedipalps are composed of the coxa, trochanter, femur, patella, tibia, and tarsus. Scorpions go through several moltings before fully maturing. It is a very slow process compared to other arachnids. The range of colors that scorpions can have is varied. We can find yellow, red, black, blue, green and gray scorpions. With these colors, they manage to camouflage in an efficient way in their environment, which allows them to be successful hunters. Some have different colored patterns on legs and body; some show horizontal lines and others have a consistent coloration in the exterior. Scorpions are easy to detect at night if you have ultraviolet light. Under this light, they look in a very intense blue-green color, such something fluorescent that glows in the dark. There is not a definitive explanation of why or for what purpose scorpions generated this fluorescence, but scientists have developed several hypotheses for this. Some think that this brightness is to attract prey, as a defense to warn predators about its danger, as a method of recognition between them, to find dark hiding places, and even other more strange theories that suggest that it is a mechanism that responds to the light of the moon. Some others think that they do not generate this fluorescence, but it occurs naturally, and a better explanation would be obtained finding out why they shine? This reaction to the ultraviolet light is due to the presence of a mixture of complex sugars and waxes in the cuticle of the scorpion exoskeleton that provides impermeability. The beta-carboline is the component that generates this particular brightness. The scorpion fluorescence is an advantage for humans, as it allows us to detect them quickly. 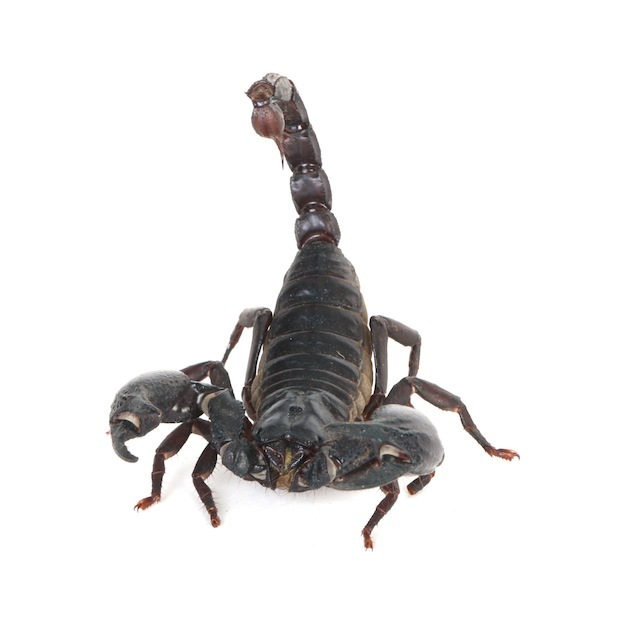 Scorpion venom is a mixture of proteins. 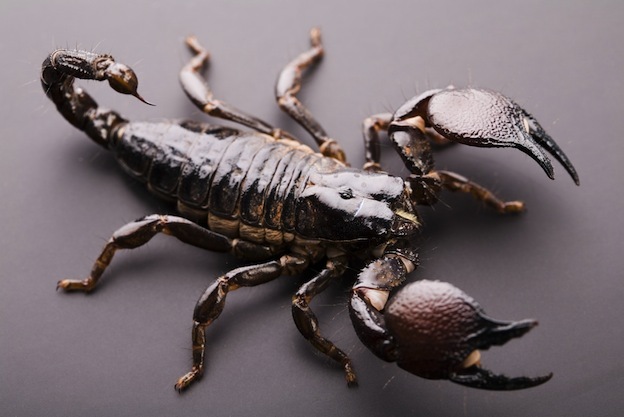 The amount of the substance secreted varies, releasing large quantities to defend themselves against dangerous opponents or only dry stinging where they do not inject poison but do cause the enemy to flee is at discretion of the scorpion.